I have come across few articles debating the use of food colouring in baking, especially in Red Velvet cupcakes or cakes. Its not that I turned into an anti-food colouring activist overnight. I do use them, in moderation, in my baking as well as cooking. I need to have some colours in my food, happy colours just like this Blue Ombre cake. 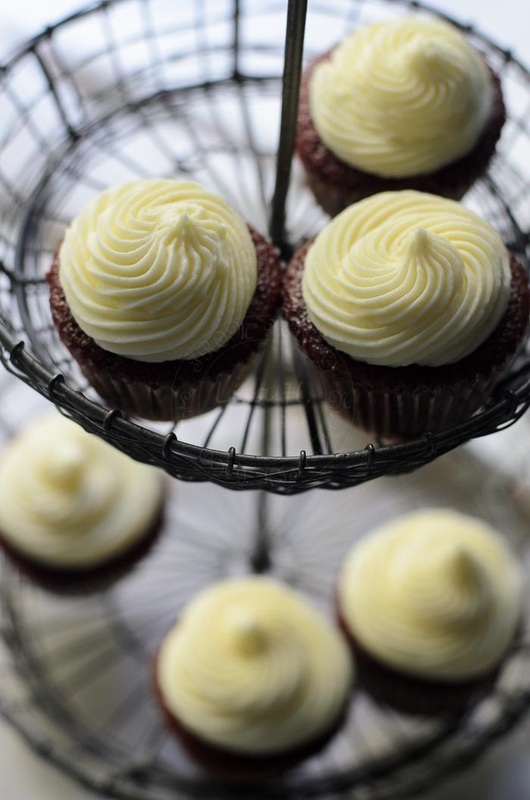 But red velvet cupcakes uses a lot more than my usual drop or two. Hence, I resort to finding alternative! 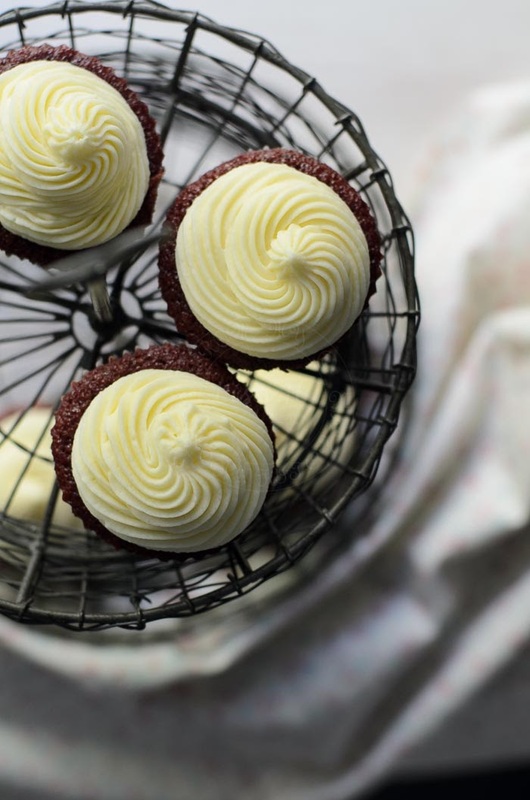 After all, I am baking these gorgeous red velvet cupcakes to celebrate my becoming a year wiser *read: a year older :(* :P.
An old gal like me do not require too much artificial colours, might trigger something in my body instead of serotonin! To maintain good health at this 'slightly' more than half century old is vital. 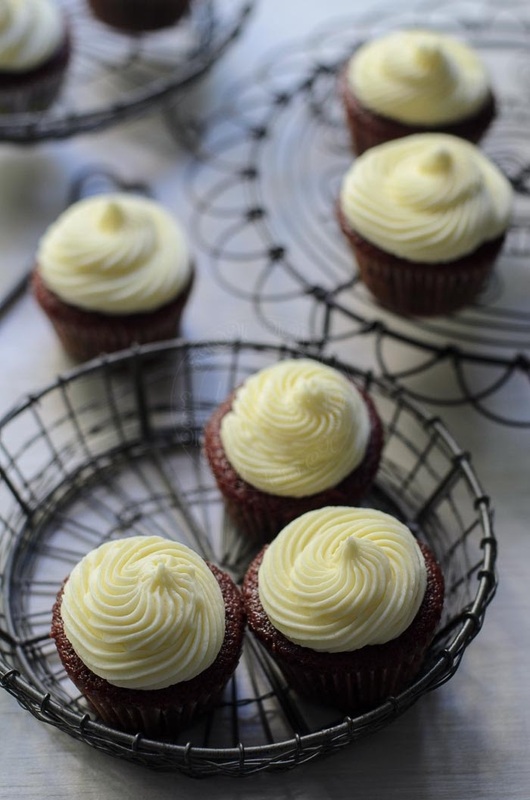 Hence I looked for red velvet cupcakes recipe that uses all natural ingredient. absolutely gorgeous. Beetroot is not everyone 'cup of tea', but I love them to bits. Beetroot has that earthy taste, its not sweet either. I love to have my ABC juice. ABC is for Apple, Beetroot and Carrot juice. Pardon the old photos, roasted beets tasted good too. This is my second bake using beetroot, my first was Beetroot Marble Cake, and shamelessly admitting that I used store-bought cake mix!!! Did a quick research on Red velvet cake recipe without any food colouring. Found few but one caught my eye, the recipe from New York Times cooking. Good reviews on the cake too. Instead of baking Red velvet cake, I decided to bake Red Velvet cupcakes. My only excuse and forever be, as always, my frosting skills 'definitely messy thus not pretty' big time :(. Furthermore, eating cupcakes makes me feel less guilty than eating a 1/8 or 1/12 of a whole cake. 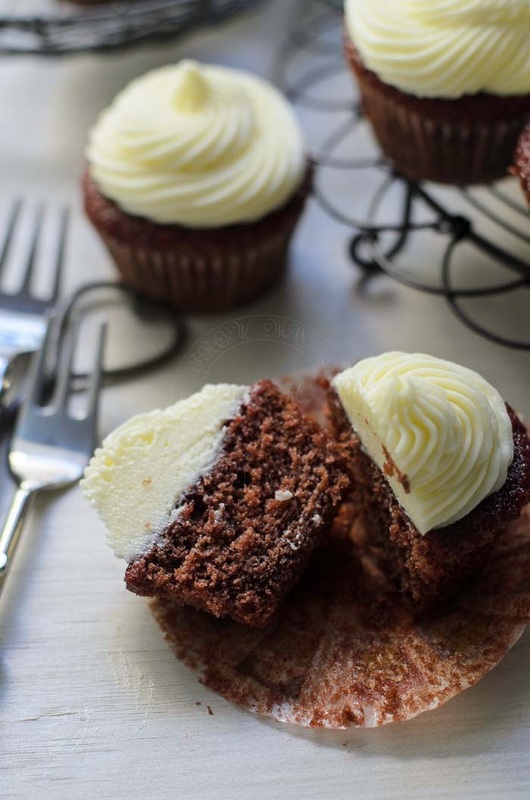 These red velvet cupcakes turned out well, soft with a hint of saltiness, chocolatey, no taste of earthy beets, how a red velvet cake should taste like. But my only comment is that these red velvet cupcakes didn't have the 'dome', they all had slight depression in the centre. 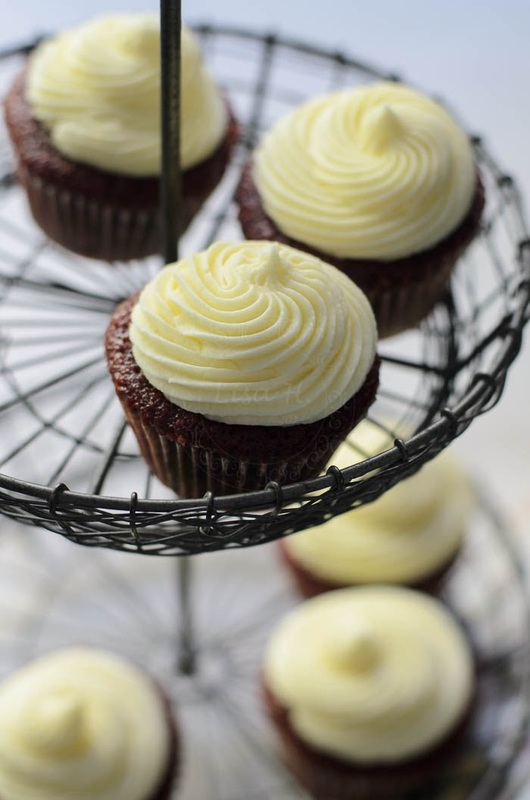 Will definitely update here if I were to bake these gorgeous, soft red velvet cupcakes again, hopefully they will rise to the occasion, and give that DOME!! Wrap the peeled and washed beetroot in aluminium foil. Once cooled, chop beets into pieces in food processor. Measure 1 cup of beet and return to food processor, add buttermilk, lemon juice and vanilla. Add lemon juice or Apple cider vinegar to milk. Put aside for at least 5 minutes. Sift all dry ingredients : plain flour, corn flour baking powder, baking soda. Add alternately, 1/3 dry ingredients, 1/2 beetroot smoothie. Repeat the process. (note : start with dry ingredients and ends with dry ingredients). Mix well in between addition. Scoop batter into piping bag and pipe approximately 40g into each bag. Check for doneness with skewer. Beat butter and cream cheese until well combine approximate 1 minute on medium speed. Add sifted icing sugar (do in 2 lots). Mix well in between. Beat the cream cheese mixture on medium to high speed until it turn pale. Scoop into piping bag with your favourite nozzle. Love to use beet in the baking for its flavour and colour. These cupcakes look perfect, Lisa. Looks so delicious and moist! Love baking with beetroot!